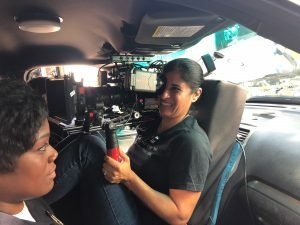 This week in our member spotlight with Cinematographer & Camera Operator Shanele Alvarez, our topics range from the importance of synchrony between directors and DPs, to the state of cinematography in television and film, AND the value of maintaining your mental and physical health while working on set. We can’t wait to talk with Shanele in more depth at NAB on April 8th in the Innovation Pipeline Theater. Find out more here and save the date! You work as a camera operator and cinematographer. Tell us about your favorite aspects about both positions. My favorite aspect of being a Cinematographer and Camera Operator is being able to paint with light and camera composition to tell a story. How do you prepare for a project? What is your approach? When I am prepping for a project I am DPing, I first go through a physically copy of the script, marking it for shots, ideas, and lighting. I also look at references the director has given me for their vision and look. Then I start to generate a shot list for myself. My shot list is used as a guide to help me when sitting down with the director to make sure we don’t miss anything or offer up ideas on how to cover the scene. If I can, I do test shots and walk through my shots for scenes, especially scenes that may have more complicated set ups. Then from there I make floor plans of lighting and the shots. Who are your cinematic idols in filmmaking and why?  Did they influence you to get into the industry? I was influenced to be a part of this industry at a very young age and by a music video and singer, rather than a movie or filmmaker. In fact, I was a huge Michael Jackson fan and the making of Thriller was the first time I ever saw behind the scenes of filmmaking. I was in awe and as young as I was, when it was over told my parents I wanted to make movies. That was what inspired me. After that I loved Spielberg and Scorsese. It wasn’t until I got into college that I started to look at DPs. Some of my favorites are Roger Deakins and Tom Stern. But honestly there are so many movies that I was inspired by their cinematography. Children of Men, Raging Bull, Deer Hunter, Lucky Number Slevin, and Sin Nombre, just to name a few. 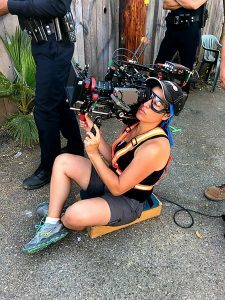 Tell us about how you prepare your body and mind for the rigors of being a camera operator. Preparing physically, I regularly go to the gym and workout. I also stretch and get massages on a regular basis. Preparing mentally I pray and listen to some hiphop and r&b on my way to work. What are the things you look for when deciding to work with collaborators? I look for a few things when deciding if I am going to work on a project. I first want to read the script. I have to see if the script is a good fit for me and if there is something I can get out of it, as well as, the director. Second, I speak to the director. I want to know their ideas and vision of the script. I want to know what inspirations they have for the project. I also want to see how much they are willing to collaborate with me on bringing the script to life. If they are willing to take my ideas and suggestions or if its their way or the highway. Lastly, I see what type of freedom and tools they let me have. As a DP, you want to be able to DP and make decisions a DP should make, and not have them made for you. That is important to me and if I am not allowed or trusted to make these decisions, it weighs on my decision to work on the project. The relationship between a DP and Director is extremely important. 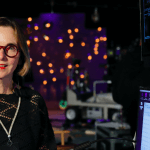 The DP is bringing the Director’s vision to life through lighting and shot composition. 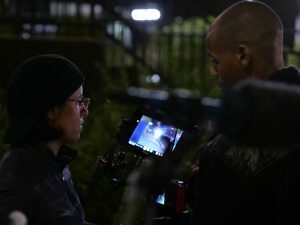 Preparation and communication is key between a DP and a Director. Going over inspirations, references, shot lists is a necessity. If the Director and DP aren’t in sync on set, the whole crew feels it and the set doesn’t run as smoothly. When they are in sync, magic happens. The relationship between a DP and an Operator is also an important one. The Operator needs to know the script, actions and be aware of how the DP is lighting. They need to be in sync with the DP on the type of composition they are looking for on that particular project (i.e. What type of scene coverage do they want/like? Long or short lenses? Movement?). Knowing your DP and style for the project helps the Operator rough in or offer shots. 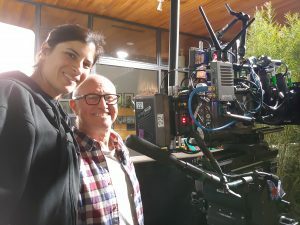 The Operator (along with the focus puller and dolly grip) is in control of the shot and is helping the DP bring the Director’s vision to life. Everyone is important and that is why filmmaking is such a collaborative art. Can you tell us about your most memorable first cinematic job? What was it like working on set? My first cinematic job was interning on a feature film called Shallow Ground. I would rush dailies over to the lab at lunch and at wrap every day among other production duties. Going to the lab was a dream. 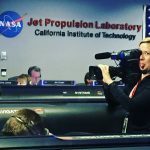 I was able to tour the lab and watch them process the film. I loved seeing the film come alive there in the lab. It affirmed my passion to go into cinematography and be a part of that magic. I was DPing a project where literally nothing we rehearsed, or tested worked on the actual shoot day. 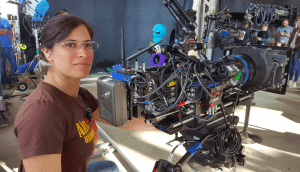 The director and I spent weeks doing test shoots and rehearsals for some difficult shots with a gimbal. When the day came to shoot, the gimbal had all kinds of issues and didn’t even leave the rental house. We had another gimbal owner come out with his rig and somehow that started to have problems as well. Our shots were daylight dependent so we ended up scrapping what we did at the rehearsals and broke up the shot into several shots just to try to make our day. We also went back to old fashioned ways of operating and creating moving shots using rolling chairs/furniture dollies and hand-offs. It was an extremely challenging day, but we finished it and ended up coming out with some decent stuff. Tell us about your experience of working with cinematographer, Alan Caso? Alan Caso is a wonderful DP to work for. He is very experienced not only as a DP, but also as an operator. He teaches you and talks with you on shots. It is also great to watch him work. As a fellow DP, watching someone so experienced, you are learning new tricks every day on lighting and composition. On my latest DP project I caught myself a few times saying don’t do this or do that..all based off Alan’s critique and teachings. I have had other mentors but I feel like I learned a lot from Alan, especially from the last show, that really stuck with me. I always hate this question because I feel like it depends on the project. I love Zeiss Superspeed lenses. They don’t work for every project’s look but those are definitely my favorite lenses. They are great for a nice drama, but I probably wouldn’t use them for a comedy. I might lean more towards the Leicas. Same with cameras, I love the Alexa mini and the Sony F55 and F65 (yes a bit older, but gets beautiful images). For docs I usually lean towards a Sony FS7 and for small projects shooting on smaller cameras and low light, I am a big fan of the Panasonic GH5 and Sony A6500. What do you think of the current state of cinematography in t.v., mainstream, and world cinema? I think the current state of cinematography is really expanding as more and more people have access to the tools necessary to do the craft. There is a lot of good talent out there and coming up faster because of this. 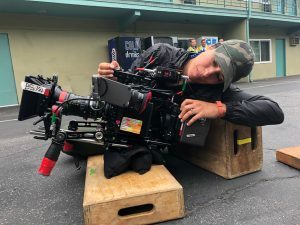 I also think because of the access to certain tools a small budget wouldn’t have been able to afford in the past; you are getting higher quality cinematography. How do you see cinematography evolving in the next few years? I see cinematography continuing to hit new heights as more tools are developed to create and compose shots. I see a lot more “one-take” shots happening and the quality continuing to improve as new tools are introduced. I also see a lot more talented women coming up in the ranks paving the way. Can you share with us, any new upcoming projects you’re working on? Recently, I have been DPing a documentary called Push Out. It is about the treatment and punishment of Black and Brown girls in high school. I am also going to be camera operating on another season of Netflix’s Word Party with The Jim Henson Company. Lastly, I am in the early stages of prepping to DP a couple spec commercials.